The Tilley T3 Cotton Duck Hat is Ray's number one choice when choosing a hat to protect him from the sun and rain. 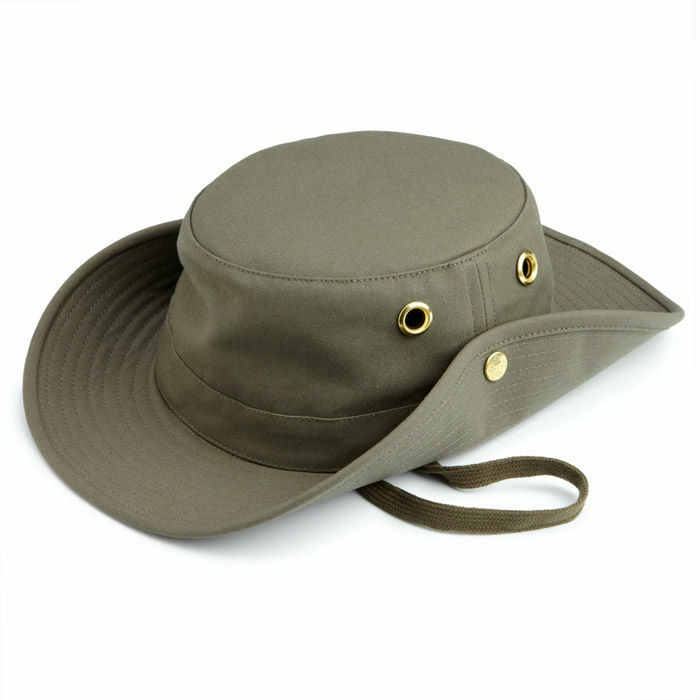 It's the same model that Ray wears during his canoe trips and is the most sought-after Tilley Hat. They are durable and versatile, so if you are going to eat your hat then make sure it's not this one! 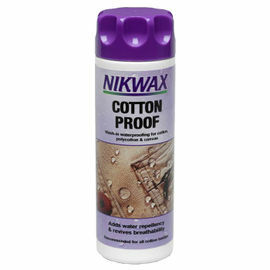 Available in olive green and handcrafted from rain and mildew resistant pre-shrunk 10 oz 100% cotton duck. This fabric is derived from an incredibly durable sailcloth that is still used in boating today. 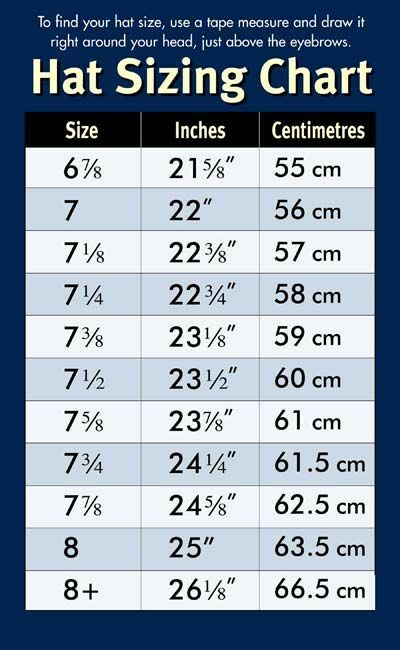 Please refer to the sizing chart picture for your appropriate size. To find your hat size, use a tape measure and draw it right around your head. For the most comfortable fit, please make sure that the bottom of the tape touches your eyebrows while resting straight around your head. Hold it there comfortably and do not pull tight. The Tilley Hat fits more comfortably than other hats. It’s designed to be worn low on your head and slightly loose. It should be held on by gravity. For the proper fit, you should be able to easily insert two fingers, flat, between the middle of your forehead and the front of the Hat. The Hat should be loose enough that you can rotate it to the left and right, and lift it up and down, without friction on your forehead. When it’s windy, use the cord. 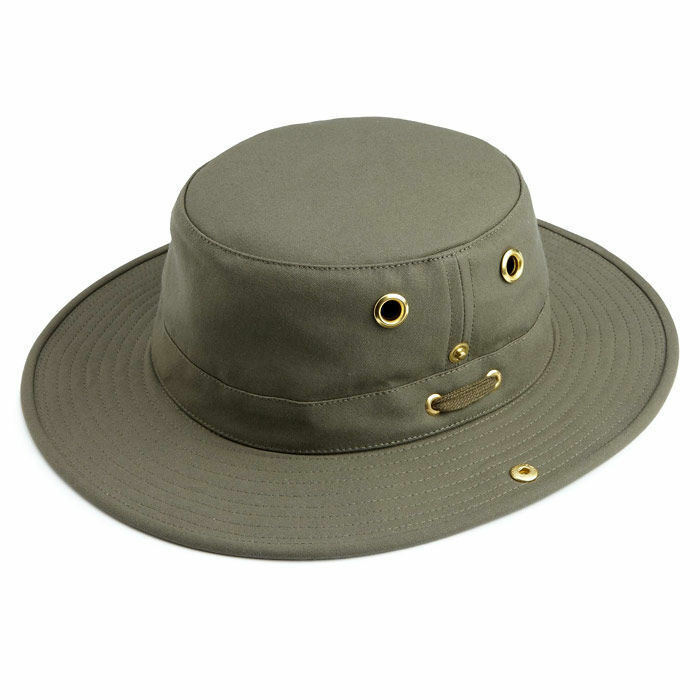 Tilley T3 Cotton Duck Hat - Olive is rated 5/5 based on 14 customer reviews. 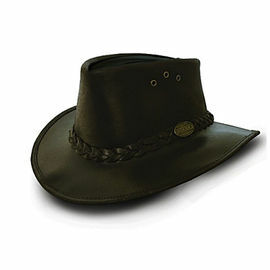 The T3 is the definitive Tilley Hat, mine was supplied in perfect working order, with both brims buttoned up. Tip - always ‘park’ the Hat with both brims buttoned up. On wearing, with both brims unbuttoned , the crown and brims will be crisp and as new. Very good value and service from Woodlore. Something to review after several years of use, so I guess two wearings is premature. Good fit and very well made. The Tilley T3 hat is excellent quality, built to last and just perfect in my head. 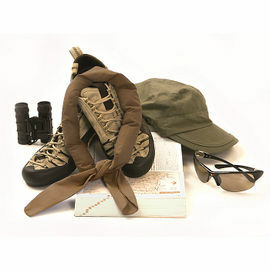 Suitable for hiking, jungle trekking, fishing etc. This is my 11th order from this website and it is never disappointed me. Shipping service is no.1. Thanks to all Woodlore Staff for the excellent service. I am very pleased with my purchase. The hat seems to be excellent quality. Have not used in the rain yet but shades from the sun very nicely. It's comfy to wear and stays on your head. Have not used it in strong wind yet so have not used both cords. I have not attempted to wash it yet. I would suggest that the Tilley sizing recommendation as per the included instruction manual is also published on the Ray Mears shopping site. This is because it recommends allowing for your flat first two fingers to be able to be slipped between the head band and your forehead. It's a bit late to read that once the item has already been ordered and has arrived. Fortunately I ordered the perfect size in that respect. Dear Stephen, Thank you for your review and for your suggestion on the sizing recommendation. I am pleased to say that Tilley''s sizing recommendation is included in the 4th paragraph of our description for the Tilley hat. Worn in the rain, didn't get wet. Worn in the sun, didn't get burnt. Worn in the wind, didn't blow off. A truly splendid hat. It is very well made indeed, using strong materials. It will protect from the sun and the worst of the rain. In order to avoid headaches or losing your hat, make sure that you buy the right size. Bitterly disappointed! At this price and with this reputation I expected a hat that would enable the wearer to walk out in rain, wind and sun in comfort for 3 seasons of the year and hoped for four seasons. 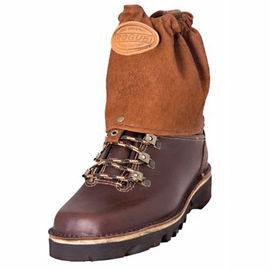 The hat size was selected as per makers instructions and fits well however even a medium breeze will knock it clean off your head unless the inbuilt laces are deployed under your chin. A strong breeze results in a bucking bronco on your head and being garrotted by the laces under your chin. I found the hat to be too warm in the early autumn sun so will be completely unsuitable for summer use and explains the frequent washing instructions. The Tilley hat is going in the bin as it's not worth the storage space. I should have stuck to tried and tested formula of farmers flat cloth cap in autumn/winter and baseball cap in spring/summer which not only outperform the Tilley Duck Hat but are much cheaper. A very comfortable and very well made hat. I love it and would refer to others. Excellent, cannot fault. Arrived in time for a summer outing to the Lake District. Took a little while to get used to, but once it had a few climbs to its name, you wouldn't really know it was on your head. It took to the wind a couple of times - though I hadn't put the chin straps under at the time. One thing to consider - make sure you try different sizes somewhere first before ordering. This way the hat should fit perfectly first time when brought online. It was scorching hot in the lakes and the hat did feel a little too tight to the head on occasions even though I had tried sizes in a shop before, and had it measured to fit my head. Naturally your head swells a little when hot, something may be worth checking when trying out different sizes. Overall - well crafted and cannot fault yet. A very nice hat, excellent craftmanship. It's already in use.